Veterinarian Shannon Dawkins is originally from Palisades, NY. She attained her bachelors degree in Animal Science from Cornell University. She then traveled abroad to St. Kitts where she studied veterinary medicine at Ross Veterinary School of Medicine. Shannon attended Auburn University for her clinical year of veterinary school, where she also met her husband, Alan. She graduated from Ross in 2006 and worked in the Catskill Mountains in NY for four years, then moved back to the South where she has been practicing ever since. 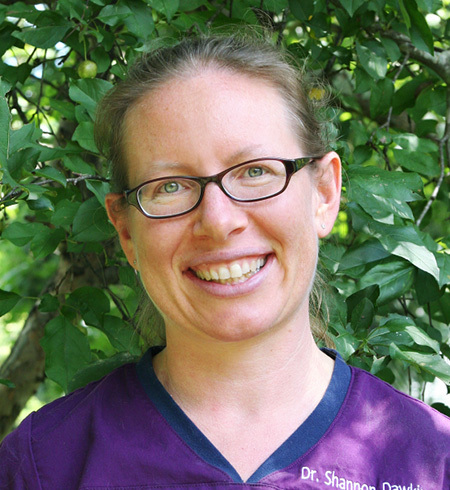 Shannon has a special interest in exotic animals and holistic treatment alternatives, and she and her husband especially enjoy caring for foster children and animals. They currently have three dogs, one cat and three parrots, all rescues. When not caring for furry critters, Shannon is an avid runner and cyclist who also loves to hike with her dogs. She is passionate about participating in charity veterinary projects in Latin America. A regular favorite is a project for scarlet macaw conservation in the biosphere of Guatemala. My kitty loved the mobile vet visit with Dr. Dawkins. It was much less stress for all of us. He viewed her as a visitor and came over quickly to welcome her to our home (much different from past experiences involving a car ride). I highly recommend the mobile vet services and Dr. Dawkins. —Wendy K.